Spencer & Locke, Vol. 2 #1 is out 4/24/2019. By Zack Quaintance — I’ve been going on about this via Twitter as of late, but the Calvin and Hobbes meets Sin City homage/mash-up Spencer and Locke is, quite simply, a must-read comic, especially for someone like me who bought the Watterson collections at book fairs in fourth grade and spent class time sneak-reading them under my desk. What Spencer and Locke does is imagine Calvin as an adult, still seeing his stuffed tiger (panther here) now as a hard-boiled police detective. That panther, it turns out, has been used all along to cope with trauma. In Spencer and Locke, Vol. 1 writer David Pepose with artists Jorge Santiago, Jr. and Jasen Smith crafts a compelling and gritty noir mystery while simultaneously deconstructing pretty much every character from the classic Calvin and Hobbes strips. It’s an audacious idea, one that could have come off as ill-advised if the creative team had not executed pretty much everything so perfectly, enfusing the whole ordeal with a massive amount of heart by giving the Calvin character a young daughter of this own (I basically crumbled everytime she interacted with the imaginary panther). With all this in mind, it would have been easy for the creative team—which has returned here entirely intact—to go back to the Calvin and Hobbes homage well. The book likely has an audience that can’t get enough of it, and so the choice could have been made to go through it all again, this time with just a new case. Pepose, Santiago, and Smith, however, start Spencer and Locke, Vol. 2 #1 by pointing the story in a faithful-yet-new direction: homaging another classic strip, Beetle Bailey. I’ll talk more about the individual merits of this issue in a moment. 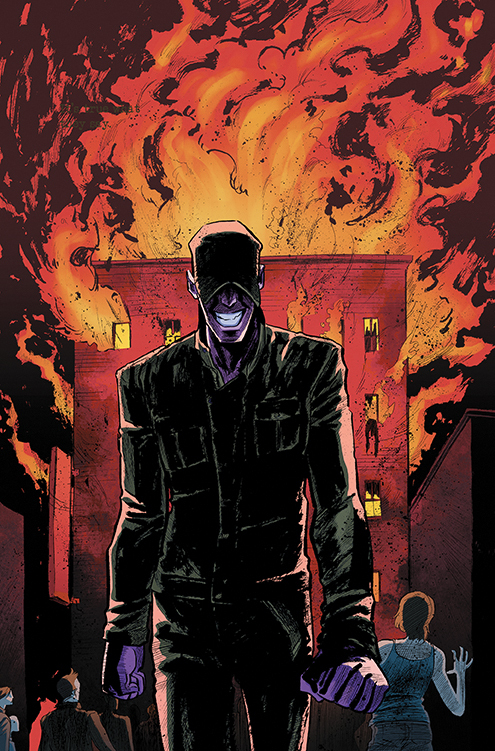 First, I’d like to just praise this decision, not only for how it functions in smoothly transitioning to a new story and a new arc, but also for how it opens an entire expanded universe for use in future Spencer and Locke stories, basically enabling the book to draw from nearly 100 years of famed newspaper comic strip characters. Previews for the next issue already seem to indicate a coming send up of Scott Adams and Dilbert, and basically all I’m saying is now we might get a rabid Snoopy cast as a pitbull in the service of a criminal Charlie Brown—just imagine. So, yes, major points to this comic for that decision. It should be noted too though that Spencer and Locke Vol. 2 #1 is on its own merits an excellent comic, much as the previous installments of this story have all been. Santiago Jr. and Smith continue to impress with their shifting aesthetics. Whereas in the first book the duo bounced seamlessly between Watterson and Frank Miller homages, this new issue requires them to also mimic Beetle Bailey, and with an assist from letterer Colin Bell, it fits right in with the rest of the story. Pepose’s script tries some new things as well. What I found perhaps most interesting was the way Spencer (who is the Hobbes analog here) started to become more aggressive, more feral in the way Locke pictured him. Pepose seems to be using that depiction of the imaginary panther to clue readers in on Locke’s fraying mental state. Like the expanded use of comic strip characters, an increased emotional range for the panther seems to expand the plethora of storytelling techniques available to this comic in a vast and welcomed way. Sometimes a book like Spencer and Locke strikes fire and struggles moving forward to replicate that same energy. That’s not the case here. Fans of the first series—a group I count myself firmly among—can rest easy, this comic has gotten even better. Check out Harry Kassen’s recent interview with the creators! 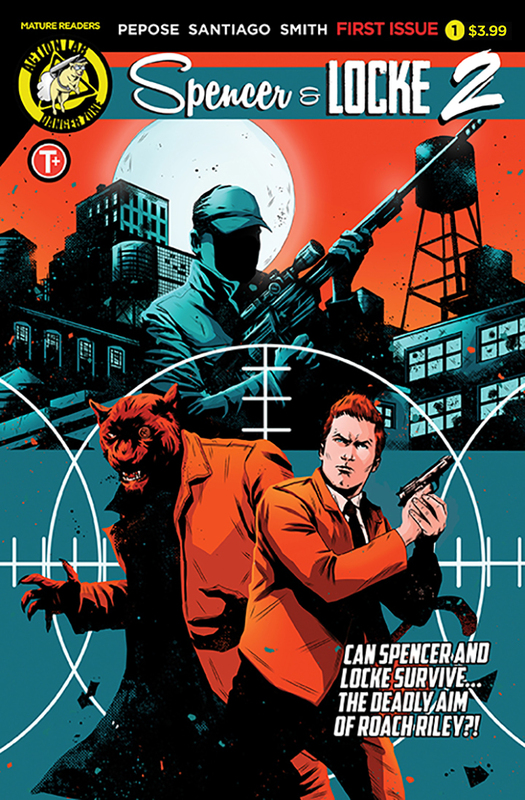 Spencer & Locke Vol. 2 #1 is out 4/24/2019 and can be pre-ordered now at your local comic shop. By Harry Kassen — Those who were paying attention in April of 2017 were treated to one of that year’s best books. Spencer and Locke—by writer David Pepose, artist Jorge Santiago, Jr., colorist Jasen Smith, and letterer Colin Bell—was an introspective, high octane thriller that answered the unlikely question “What would you get if you crossed Calvin and Hobbes and Sin City?” Now, two years later, the team is reuniting to tell another story about Spencer, Locke, and now, Roach Riley, a new character inspired by Beetle Bailey. David Pepose and Jorge Santiago, Jr. join us to talk about working together, creating the series, and what’s to come in Volume 2. Batman’s Bookcase (BB): You cite Calvin and Hobbes and Sin City as your influences for Spencer and Locke. What about those called out to you as needing to be combined? David Pepose (DP): When I first had the idea of writing a comic of my own, I was really into mashup music at the time—weird but fun combinations like Nine Inch Nails meets Call Me Maybe—and I thought to myself, what would a mashup comic look like? Classic Frank Miller was the starting point for the series, since his work with John Romita, Jr. on Daredevil: The Man Without Fear really stuck with me growing up—but then I thought, what could be the weirdest thing we mash up with that body of work, that would still stick the landing? A lot of the first ideas I came up with felt more like shock for shock value’s sake—which might get you some attention at the outset, but isn’t really a sustainable foundation for a long-lasting readership, y’know? It was only when I thought of Calvin and Hobbes that the whole story clicked into place—I thought about a beat-up cop, grinning wildly in the rain, holding a stuffed animal in his hands. What’s the story with that guy? What kind of home life must he have had, to hold onto an imaginary friend well into adulthood? That’s when I started thinking about childhood trauma, mental illness and PTSD, which became the bedrock of what Spencer & Locke was truly about. BB: David, what about Jorge’s work made you want him for this project? And Jorge, what about this project made you want to work on it? Jorge Santiago Jr. emotive artwork from Curse of the Eel. DP: Jorge’s portfolio immediately impressed me because not only were his action sequences fluid and exciting, but you could really feel the emotion he gave his characters. It was Jorge’s art that really helped sell our initial concept, because he allowed us to play this story as humane and empathetic rather than something over-the-top or hyper-exaggerated. Jorge Santiago Jr. (JSJ): David’s email came at the right time when I was about to graduate from SCAD Atlanta. I was already interested in the crime fiction and crime comics at the time, and was planning my own mash up of crime stories with horror when David approached me, and it seemed like it’d be fun, so I took a shot at it. BB: Whose idea was it to have the flashbacks drawn as a Bill Watterson pastiche? Was that always the plan or did that come later? DP: Yep, that was always the plan—Ed Brubaker and Sean Phillips did a similar effect in Criminal: Last of the Innocent, and I thought it was a smart play that could be pushed even further, to remind readers of our influences and reinforce that shift in time. The flashbacks also let us lull readers into a false sense of security with this instantly familiar style—we wanted to weaponize their nostalgia, building up their expectations before flipping everything on its head. A Bill Watterson pastiche from Spencer & Locke Vol. 1. JSJ: David wanted those in there from the start, although I’m a huge supporter of using art to tell the story in comics. I feel like a lot of stories, noir ones included, rely a lot on captions to tell the story, and I think that in a story like this, letting the art clue the reader in at key points is essential to an immersive read. Our flashbacks let us avoid a lot of captions that set scenes, so it lets us tell a story without being overly redundant or confusing our readers on what they’re looking at. BB: There’s a lot of storytelling in the colors, especially in the contrast between panels in full color and panels in black and white with color backgrounds. What’s your process with Jasen (Smith, colorist) for working out what those are going to look like? JSJ: Generally I don’t really try to lead Jasen too much when it comes to the colors. I will ask for some things if I feel it might help or if I have something in mind that I would like to try, but I trust Jasen to do what he’s on the book to do. My focus is on keeping the panels clear and distinct so Jasen has an interesting but fun canvas to paint on. Jorge Santiago Jr. artwork with Jasen Smith colors. BB: I’ve read the first issue of the new series but for our readers, what’s changed since we last saw our heroes? DP: When we reconnect with Spencer and Locke, we’re going to learn that things have not been great for them since they solved Sophie Jenkins’ murder. Locke finds himself suspended by Internal Affairs following the sizable body count he left in the last arc, which puts both his career and his bid for custody of his daughter Hero in jeopardy. But even more importantly, Spencer and Locke are finding themselves what might be considered an existential crisis - they faced all of Locke’s childhood tormentors and dealt with them about as decisively as humanly possible… so why doesn’t Locke feel any better? Unlike what Hollywood action movies might try to sell you, catharsis doesn’t come from the end of a gun - and given that Spencer is just a figment of Locke’s subconscious, Locke’s inner turmoil means his partnership with Spencer has become fraught with tension and restlessness. Just because Spencer and Locke confronted their past doesn’t mean they’ve necessarily moved past it - they’re going to have to figure out how to live with their scars, because the world won’t necessarily tolerate their violent brand of crime-fighting. JSJ: I think the scope of the world has changed with second volume. The view in volume one is limited to Locke and his horrible family, but with volume two, the lens pulls back so we can see more than just a brutal household. The city is more alive in our volume two, and I think that will be immediately clear with the increasing number of cast members and with a villain that literally has come from across the planet to make sure the world hears his message. BB: The end of volume one very easily could have been the end of the whole story. What made you guys come back? Was this always part of the plan or did you just find that the story was calling you back? DP: The hardest part about the first Spencer & Locke was not telling anyone our secret—that parodying Calvin and Hobbes was just the tip of the iceberg, and that the plan was to take the Fables-style shared universe approach across the funny pages for volume two. That escalation felt really organic to me, and let us play with the world and raise the stakes in such an interesting way—when I was reading the comics section as a kid, these varied comic strips were all on the same page, so why not put them in the same universe? But the other thing was, I felt like there was still things left to be said about Locke and his unique journey, ways that we could continue to subvert action movie tropes and tell a deeper story about how we cope with the scars that life gives us. We had so many fans tell us they wanted to see more of Spencer and Locke’s adventures, and even more importantly, we had readers who were themselves survivors of abusive households tell them how much our story meant to them. It’s hard to not want to continue when you get feedback like that. BB: How does it feel coming back to this world? Is it weird to be working on this again or does it feel like you never stopped? DP: Honestly, I feel like I’ve been in Locke’s headspace for the better part of five years now, but it’s always fun to discover new things about these characters, or to try a different angle we haven’t seen before. It’s been actually kind of freeing to expand Locke’s world, particularly seeing him interact with foils like Spencer, Roach, Hero and Melinda — each of these characters reveals something different about Locke, which in turn makes the world around him feel that much more vibrant and well-realized. JSJ: It isn’t so much weird to be coming back, but it’s more that I’ll get to have another chance to show these characters grew or didn’t grow during the events of volume one. I hope that readers understood that in Locke isn’t the typical action movie hero where he gets a happy ending; to Locke, he doesn’t deserve one, so to follow this character around and depict his struggle with his delusions while still trying to be a good person is interesting. I think Locke still has room for change, and unfortunately for him, it’s coming whether he’s ready or not. Roach Riley is to Beetle Bailey as Spencer and Locke are to Calvin and Hobbes. BB: The first volume obviously took some liberties but it took all of its inspiration from Calvin and Hobbes. What’s it like bringing in a new character (Roach Riley) from outside that world and adding him to the world you have? DP: The biggest challenge for me writing Spencer & Locke 2 was making sure that we built up Roach as a villain who feels as three-dimensional and complex as Spencer and Locke themselves—and honestly, I’m incredibly proud of what we came up with. Roach is very much Locke’s dark mirror image—while Locke had Spencer to help him cope with decades of trauma, Roach has withstood just as much horror and suffering in a much more accelerated time frame. The sole survivor of his platoon overseas, Roach has come back as a relentless killing machine, an apostle of pain who’s looking to spread the good word to as many people as possible. The thing about Roach is he isn’t just a physical threat—he has a twisted philosophy behind his actions, a sort of nihilistic worldview that if you squint in the right way, might just make a weird sort of sense. The battle between Locke and Roach is just as much a war of ideas as it is a physical conflict, and watching the sparks fly between them really is the highlight of the book. BB: Roach Riley continues the trend of having flashbacks done in a more classic cartoon style. What went into the style choices for his flashbacks? JSJ: I tried to study and metabolize the style of Mort Walker’s Beetle Bailey and make it work for me in a way. These style changes are usually the first thing people notice when they open the book, and what I’m glad about so far, is that not too many people feel like they were drawn by someone else, which would be the worst thing. With these and the Watterson-esque flashbacks, my goal is to create a hybrid style of my own and theirs because if it looks like someone else drew them, then it might confuse the reader on what they’re looking at. I remember a few years ago, I read a superhero comic that had an ad for a candy bar in a comic style similar to the art of the comic and it confused me for a minute. This was what I was hoping to avoid, and also just straight up ripping off the art of classic cartoonists, because that would have been the height of disrespectful. Mort Walker’s Beetle Bailey comic strip. BB: Is there anything you guys changed about your style or approach for this volume? Were there any things from the first volume you were unhappy with that you changed for part two? DP: Just by virtue of the high concept, we wanted to do everything bigger than before - while the first Spencer & Locke was more of an intimate psychological thriller, Spencer & Locke 2 gets to play out Locke’s psychodrama across an entire city. Whereas the first series felt like Memento, this sequel gets to be more like The Dark Knight or The Empire Strikes Back—the stakes and scale are larger, but we still work to keep these larger-than-life situations personal to our characters. One of the biggest changes to our sequel is also our supporting cast—in addition to Roach as our big bad, we also get to follow the members of Locke’s surrogate family. I think Locke’s new love interest, Melinda Mercury, is particularly important representation, as a woman and a person of color whose investigation into Roach’s mission will cause some major shake-ups down the line. Locke’s young daughter Hero also plays a big role in our sequel—she’s graduating to more than just a hostage, but a character with her own agency and her own direction. While Spencer and Locke’s unique dynamic is the engine that drives our story, I’d argue that Hero is the heart. JSJ: I’m definitely glad that now that the focus is off of Locke's family and onto the world at large, we can show a wider cast of different people and build up characters that wouldn’t have fit in the first volume. Like, we have almost a whole issue dedicated to Melinda and Hero this time around, and that might be my favorite issue of the bunch. When I write my own comics, I tend to make the casts mostly women and people of color, so volume two was definitely more in my wheelhouse, although there's still a lot of action that is definitely not in my wheelhouse. I also wanted this book to be more visually rich than the previous one. With the comic coming to focus on Roach and him being a broken mirror of Locke, I got to play with some really fun visual imagery and symbolism that I hope people will enjoy. I think that Spencer and Locke, as well as Calvin and Hobbes in a way, are really two faces of the same coin. In S&L, Spencer is Locke's nurturing and caring side, while Locke is the practical, cynical side which more represents how he sees the world. I think that having that duality in a main character is interesting, and portraying that struggle of Locke deciding which voice he should listen to as the world burns around him will make this book much more unique of a read compared to our first volume. Also, I put references galore to some of my favorite stories and fans of Resident Evil 2 will notice something around issue two but definitely in issue three and four. See if you can find them all! BB: Now that you've done Calvin and Hobbes and Beetle Bailey, what funnies character(s) would you guys want to tackle next? Gary Larson’s The Far Side. JSJ: I don't know, we kind of cover a bunch in volume two that I'm not sure how we could give them more time or more love. Maybe FoxTrot? I always loved it as a kid, so maybe that would be a fun one to interpret. Or The Far Side, something weird. Spencer and Locke Volume 1 is available from comic shops and bookstores. The first issue of Volume 2 releases on April 24th but can be preordered now at your local comic shop using these codes: FEB191309 (Jorge Santiago, Jr. Main Cover), FEB191310 (Maan House Variant), or FEB191311 (Joe Mulvey Variant). Sign up for the weekly newsletter from Batman’s Bookcase. Spencer & Locke, Spencer and Locke, Calvin and Hobbes, Action Labs, David Pepose, Jorge Santiago Jr.